If you love the Dancing Grannies, then you are in for a treat! 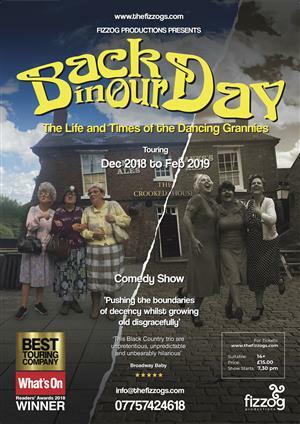 ‘Back In Our Day’ is an hilarious comedy charting the friendship of 3 remarkable Black Country women and how they met through their love of dance. Get to know the real grannies and what makes them tick, follow their lives from the 1940’s through the decades to the present day from Pam’s People to Brit Pop. ‘Pushing the boundaries of decency whilst growing old disgracefully’ is their moto.